The vicinity around what is now Kawaihae Harbor (“the water of wrath”) has been the scene of many important events, from the killing of Kamehameha’s rival and cousin, Keōua in 1791, to interactions with foreign visitors, including Captain George Vancouver of Great Britain, Otto von Kotzebue of Russia, and dignitaries from France, the United States and other nations. When the Pioneer Company of the American Protestant missionaries arrived the next year, they first stopped at Kawaihae; this is where the missionaries first learned that the kapu system had been abolished and heiau were destroyed. Over time, Kawaihae and Waimea (up the hill) developed a synergistic relationship. The area was a canoe landing area, whether for commerce or combat. (This is where Maui’s chief Kamalālāwalu landed in his assault against Lonoikamakahiki’s Hawaiʻi forces (Lono won.)) But Kawaihae’s presence was really focused on commerce as a landing site. A 1914 map of Kawaihae Village shows a concentration of development along the shoreline; the uplands of the Kawaihae region remained undeveloped pasture land. During WWII war years (1941-1945,) Kawaihae’s role as the shipping outlet for Waimea was intensified. Troops were shipped in and out through Kawaihae. At the southern end of the bay, in Kawaihae 2, amphibious landing exercises were conducted and military emplacements were set up in the area of Puʻukohola Heiau. The old landing had been destroyed in the 1946 tsunami and the one built in 1937 had proven unsafe in high seas. By the 1950s, the need for improved harbor facilities at Kawaihae was apparent. The harbor was created by dredging part of an extensive coral reef which extended 4,000-feet seaward and ran along the shore more than a mile south of Kawaihae town; the reclaimed reef area created a coral flat peninsula that extends approximately 1,000-feet makai (seaward) of the piers across the natural reef, forming a beach along the south harbor boundary and terminating at the outer breakwater. The South Kawaihae Small Boat Harbor entrance channel and 850-foot West breakwater was constructed as part of Operation Tugboat and completed in December 1970. As part of Project Tugboat, the Army used conventional high explosives to blast an 830-foot entrance channel, 120-feet wide/12-feet deep and a 200 by 200-foot turning basin. 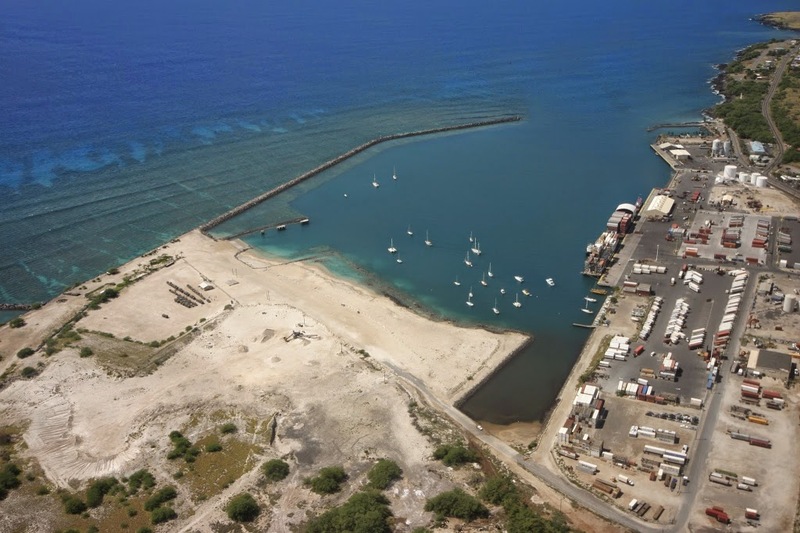 After years of delay, it was recently announced that a project to improve the eastern portion of Kawaihae Small Boat Harbor is moving forward. Among the improvements are a 445-foot long floating dock, as well as a 47-foot-long access ramp, gangway and 25 berthing stalls. Later a paved access road and new water system is planned. The image shows Kawaihae Harbor. In addition, I have added other images in a folder of like name in the Photos section on my Facebook and Google+ pages. Kamehameha had granted Kawaihae Komohana ahupua‘a (present Kawaihae 1) to Kalanimōku, his “prime minister;” Kawaihae Hikina (present Kawaihae 2) was one of several ahupuaʻa on Hawai‘i and other islands allocated to John Young by Kamehameha. Then, as now, the area was relatively barren and people typically lived near the shore, not up the hill. As noted in 1832, by missionary Lorenzo Lyons in his journal, “about as desolate a place as I have ever seen, nothing but barrenness, with here and there a native hut”. She would later become the wife of her half-brother Liholiho (Kamehameha II,) the son of Kamehameha and the high chiefess Keōpūolani (Kamāmalu died of measles in London with Liholiho in 1825.) Some suggest Queen Emma (granddaughter of John Young) was also born here. Over time, Kawaihae and Waimea (up the hill) developed a synergistic relationship. The area was a canoe landing area, whether for commerce or combat. (This is where Maui’s chief Kamalālāwalu landed in his assault against Lonoikamakahiki’s Hawaiʻi forces (Lono won.) But Kawaihae’s presence was really focused on commerce as a landing site. Young built a storehouse in his family compound. During the sandalwood trade, Young supervised royal warehouses that were the central depository for the wood brought in from the surrounding district. During subsequent decades, other missionaries visiting Hawai‘i Island would record their impressions of the life and landscape of the 19th-century Kawaihae region. According to Rev. William Ellis, who, along with other missionaries, stopped at Kawaihae in 1823, the village in the early 1820s contained one hundred houses. The salt also came in handy with the region’s supplying whalers with fresh and salt beef that called to the Islands, as well as the later Gold Rushers of America. Here is where Samuel Parker (of the later Parker Ranch fame) started out as a cattle hunter to fill those needs. Increasing demand for meat, hides and tallow prompted Kuakini, governor of Hawai‘i Island, to establish a residence (and corrals) at Waimea in 1830. After having difficulty traversing the rocky trail from Waimea to Kawaihae, he “wisely sentenced forty persons guilty of violating the seventh commandment (committing adultery”) to construct a road connecting the two. The WWII years brought dramatic change. The vast isolated plains of Waimea were viewed as an ideal location for a troop training center and in the spring of 1942 an army recruit camp was built there. The recruits were followed by the Second and Fifth Marine Divisions that recuperated and trained at Waimea. At its height, the Waimea camp (later dubbed Camp Tarawa,) consisting of tents and Quonset huts set on thousands of acres, housed up to 40,000 men. Troops were shipped in and out through Kawaihae. At the southern end of the bay, in Kawaihae 2, amphibious landing exercises were conducted and military emplacements were set up in the area of Puʻukohola Heiau. By the 1950s, the need for improved harbor facilities at Kawaihae was apparent. The old landing had been destroyed in the 1946 tsunami and the one built in 1937 had proven unsafe in high seas. The Kawaihae Deep-Draft Harbor project was authorized by the US Congress in 1950 and finally dedicated on October 5, 1959. On August 17, 1972, the US Congress authorized the designation of Puʻukohola Heiau as a National Historic Site. 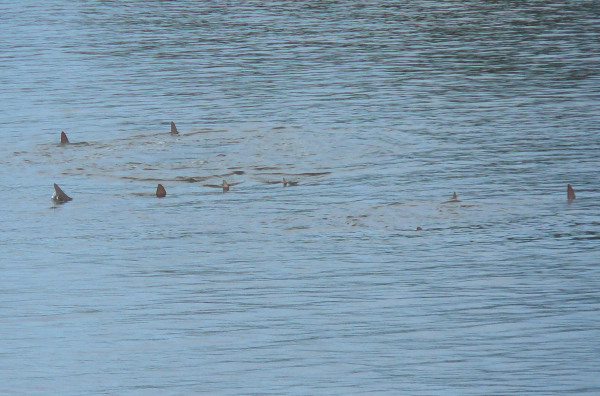 This site also encompasses Mailekini Heiau; Hale O Kapuni Heiau (a submerged “shark” heiau;) Pōhaku o Alapaʻi ku palupalu mano (a stone on the beach where chief Alapaʻi leaned against while watching sharks circling around offerings placed at the submerged heiau;) Pelekane (Kamehameha’s Kawaihae residence) and the site of John Young’s house. 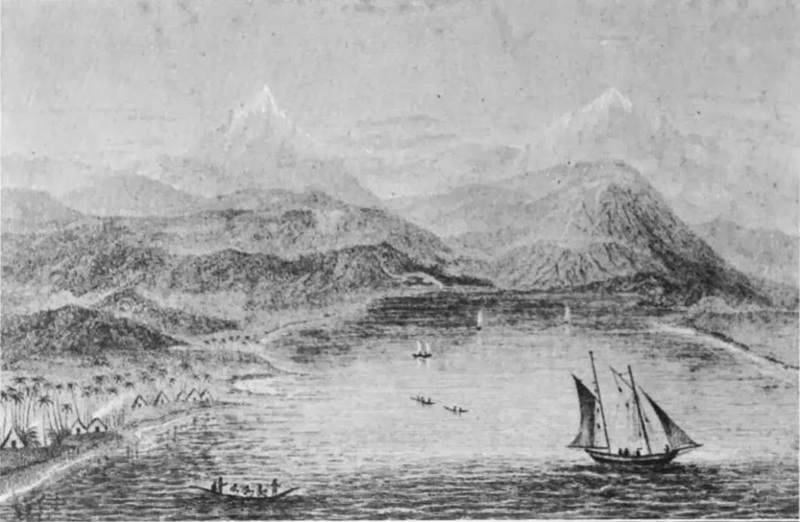 The image shows Kawaihae Bay, as drawn in 1822. In addition, I have added other images in a folder of like name in the Photos section on my Facebook and Google+ pages.